Complete At-Home Flexibility Training in 15-min Per Day Designed for yoga students, athletes, office workers, and busy moms... the YOGABODY® Flexibility Kit offers a step-by-step, five-day per week routine you can do before bed to systematically regain your functional flexibility. The kit includes nutritional support, yoga props, and all the educational materials you’ll need to get started. 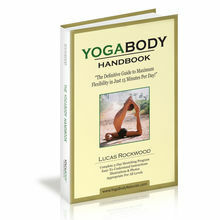 YOGABODY® Flexibility Kit has been added successfully to your wishlist. Designed for yoga students, athletes, office workers, and busy moms... the YOGABODY® Flexibility Kit offers a step-by-step, five-day per week routine you can do before bed to systematically regain your functional flexibility. The kit includes nutritional support, yoga props, and all the educational materials you’ll need to get started. Lucas, thanks a lot !!! I definitely know when I’ve not been taking my Yogabody Stretch… Usually because it’s at a time I get overburdened with work/travel, slip up nutritionally, miss my practice and forget to take my supplements. Prone to osteoarthritis, Yogabody Stretch has been a great ‘find’ for me.. And I’m SO pleased I can get it in the UK now too ?? !! The supplements have helped me improve my flexibility, strength and confidence, and for sure I am going to order my Yoga Trapeze soon!!! I cannot wait to give it a try. Thank you guys for all the videos, tips and great teaching!!! I have never been particularly flexible, but I find that with a mixture of the Yoga Gravity poses and the supplements, it does help. I enjoy holding the poses for a longer period of time. I had some hormonal issues and gained some weight recently, so some of the Yoga Trapeze poses are tricky. But, I still enjoy stretching my back. I have only been taking the YOGABODY Stretch for a few weeks, so would have to have a little more experience to absolutely recommend them. But, so far they seem to be helping. My flexibility is improving as time goes on. I have ordered your supplements and will do so again. They seem to be working for me, but since I am 67 the process is slow but worth it, really worth it to work myself back to better health and flexibility. I have only been using the YOGABODY Stretch for a short period of time so I cannot say that my flexibility has increased a lot. But I am much more comfortable when I do stretch. When I am at my edge in a pose, rather than counting the seconds until a pose is over, I am actually comfortable in the pose. I even feel my hamstrings fully release sometimes. That for me is pretty awesome as I haven’t been able to do that in all my 15 years of practicing. I can get my knee on top of my shoulder in long lunge, and I can get my foot to the top of my head (but not behind yet). I can do front splits, but not straddle, however my straddle has improved marginally so that at least now I can get as wide as the length of my yoga mat. I’ve never been able to do straddle even as a toddler. My strength is definitely improved, I can do one-handed handstands and lift up into them now still using the wall for support, and can do two-handed stands on my fingertips. I think given more time and practice, I will see further improvements. It’s been a long recovery from several significant injuries and internal scars from the past. I wish I had found this years ago! I found YOGABODY Naturals after searching for something to help me stretch further, as a Yoga teacher I am always looking to expand my practice and get deeper into backbends, so I gradually changed my diet cutting out caffeine, refined sugar etc…… I finally decided to go ahead and get YOGABODY Stretch after reading about what supplements were best for flexibility and finding YOGABODY Naturals contained everything you need (also cheaper than buying each supplement from health food stores) plus a lot of information, tips & support included. …I do not have to suffer from any muscle and back pain. I’ve used Yogabody for two weeks now. I am happy about the purchase. Within days of using yogabody Stretch, I was able to achieve some of the yoga poses without being sore all over afterwards. I’ve been on and off my yoga practices because of the muscle and back pain caused by the practice. Now, I’m able to work on my yoga poses each and every day thanks to yogabody. I could never image that I could be as flexible as I want to be and the better part is I do not have to suffer from any muscle and back pain. I also have more energy nowadays. My husband was so ridiculously inflexible, I bought the Gravity Stretch book for him to take away to practice prior to Ironman New Zealand. While he was away I thought I’d also try the exercises out. Amazing! I was really surprised at the difference in hamstring length and hip openness. In a Ragdoll forward fold I was normally probably a few inches off the floor. After just a week of doing these, I easily had arms on the floor, plus a bit. Used in conjunction with the Stretch, they’re a pretty powerful combination. I suffer from a sciatic problem on one side and taking Yogabody Stretch helped so much that I can now almost get into the splits on that side. What’s more, I found I have extra energy to go with it. I have purchased the Liquid Energy-B, Yoga Trapeze and YOGABODY Stretch supplements. 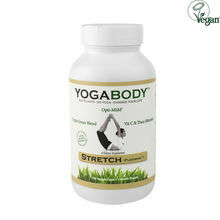 Of all of my purchases so far, I have only used the YOGABODY Stretch supplements. Like a lot of people, I prioritize other things over exercise and taking care of my body. I don’t drink as much water as I am supposed to, and I don’t eat as many leafy green vegetables as I’m supposed to, despite being a vegetarian. When I was good about drinking plenty of water, limiting my intake of dairy products, getting my dose of leafy greens with my green drink smoothie, and practicing my Gravity poses back in 2011, when I first discovered your products, I found that the YOGABODY Stretch helped me recover from soreness quicker. I’m not a very handy person, and my home has tall ceilings. I haven’t even tried to figure out where the best place is to hang the yoga trapeze. It looks and sounds great, and I can’t wait to start using it, but I need to set it up. I procrastinate when it comes to these things, especially when I’m juggling a busy schedule as a stay-at-home-mom of three. I have not tried the liquid energy B yet either, since I was finishing off my current B12 supplements. I look forward to trying that as well. I would definitely recommend Yogabody Naturals products to any of my friends and to anybody who is looking for alternative, safe ways of staying healthy and living life. Thank you, Lucas, for all that you do for the worldwide yoga community and for the community at large! I can definitely notice a difference in my flexibility and fluidity of my joints when I DON'T take the YB Stretch. I am seeing a marked difference in my flexibility with the Flexibility kit & plan in place, and the supplements are definitely working. 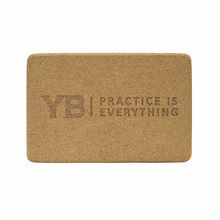 I feel wonderful and will continue to support & recommend YB! I am definitely seeing an improvement in flexibility during my practice with the gravity poses I do. I am not sure if the YB Stretch supports this as well, but it incorporates more natural versions of ones I was already taking so I think the benefit of having them together in a high quality product is a positive one compared to what I was taking. I do feel this Flexibility Program has certainly improved my flexibility and I haven't been totally committed. I love the supplements, block and strap that came with the program, I'm looking forward to some warmer weather so I can really commit and improve my flexibility! Your Flexibility series has helped stretch my shoulders and hamstrings like never before. I have a lot of old injuries that have caused me to become really imbalanced for a 29 year old. I've tried everything on the planet to help correct and restore my body and becoming more flexible is one of my key goals. I've always had tight hamstrings and hips and decided if I could free those areas up, I could more effectively heal and realign. Doing general yoga was great and all, but it's hard to do a downward dog effectively if your hamstrings won't let you get close to the correct position. All I wanted was to get the flexible aspects of yoga right now and the flexibility kit, in two weeks, has done more for me than 1 year of hit-and-miss yoga. Gravity Yoga has been a wonderful entry level practice that has eased the pain in my back and hips. The supplements have given my body the power to heal better, my mind more clear and happy, and have given me the nutrients my otherwise healthy diet was still yet lacking! And the Gravity Yoga program has helped my daily pain from fibromyalgia and given my body more freedom and range of motion! Also, doing this program before bed helps me to sleep deeply and calms my RLS. The podcast has been fantastic in introducing new information on nutrition and wellness. In particular, the episodes on flexibility training and nutrition have been helpful and I have incorporated some of the training techniques and nutritional guidelines. As a result of the podcast I have purchased the flexibility supplement and have been taking it for about 2-3 weeks now. My flexibility has improved and I have seen a decrease in some chronic lower back pain due to forward folding & backbending (I practice ashtanga primary) not sure if this is the result of the supplement or eating more mindfully for flexibility or the incorporation of flexibility training in conjunction with my practice … but I'm happy either way!